Music listing from around town for the month of January. The 40th annual New Orleans Jazz and Heritage Festival will be held at the New Orleans Fair Grounds on April 24 – 26 and April 30 –May 3, 2009. Tickets are $40 with the gate price set at $50. Children ages 2 – 11 are $5.00 in advance and at the gate. Go here to purchase tickets. Premium tickets for the “Big Chief Experience,” and the newly-created “Grand Marshall VIP Pass,” packages that includes Festival admission with re-entry privileges; access to special viewing areas at major Festival stages and in some tents; the limited-edition official Festival poster; access to an air-conditioned hospitality lounge; special access to restrooms and beverage concessions; parking, if desired; and more are available here. Search OffBeat’s Jazz Fest database to find out when and where your favorite band or type of music is playing at the Fest. 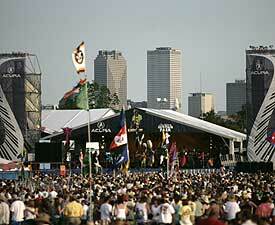 Go here to download printer-friendly pdfs of the Jazz Fest map and stage schedules. 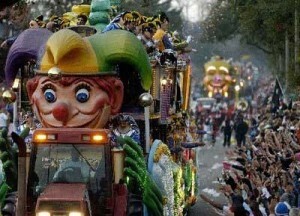 Go here to see alphabetical listings of all acts playing at the Jazz Fest arranged with stage and time info included.